High quality fertilizer (compost) is obtained by keeping green wastes such as green branches, leaves, grass in kraft sack for a certain period. Due to carbon contribution of kraft paper, nitrogen-carbon rate of fertilizer obtained is high. Those items taken from nature are made useful for environment again as natural fertilizer and hence contribution is made to the nature. It especially allows green wastes such as grass, leaves, branches, etc to be put in use at municipality parks and gardens, private gardened houses. 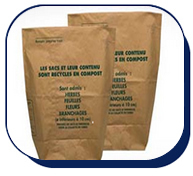 Compost sack keeps its contents for a long time without causing any decomposition even in tough, variable conditions. Kraft sack, only solution to put green wastes into good use, is resistant to moist and water and also practical and economic and protects environment. For collection of green wastes, open mouth hexagonal bottom sacks which ensure sack and green waste inside become compost fertilizer together without harming their properties are recommended.